Remember the scene in Pirates of the Caribbean that shows The Interceptor in a raging storm and howling winds, and Mr. Gibbs asks Jack why he’s smiling? Remember what Jack says? I do (and not just because I’ve seen Pirates 50 times). It’s enough to put a grin on the grimmest outlook. Making progress is fun, no matter what else is going on. As of two weeks ago, I was beginning the next module in my screenwriting class (covering subtext – fascinating stuff) and bemoaning how far behind I’d gotten. I totaled it up – 22 missed assignments. Yikes. 22 lessons, from 6 different modules. So I made a plan. In a nutshell, the plan involves food, sleep, and writing. And I’ve been working that plan. And as much as it hurts to say no to outside interests that would drag me away from those core activities, I have to smile when I see all the tracks I’ve made in this whirlygig storm of activity. As of today: 7 down, 15 to go. Oh yeah. Kristen froze mid-air, filled with a mix of glee and dread. She had never encountered an animal of this scale before – what should be done? No answers presented themselves except to carry on. So Kristen, vine in hand, climbed and slipped and fell her way back to solid ground. “I’m coming!” she called into the pit. She tried to secure one end of the vine like she’d seen on TV, but the woody fibers did not respond well to the clumsy knots she attempted. They simply fell apart as soon as she let go. Aside from a little shock, Kristen was none the worse for her unexpected trip south. She got to her feet and gazed up at the sasquatch who was staring at her with equally frank curiosity, the crushed threads of the vine smooshed between his fingers. Ron seemed to register this somehow, and countered with a mighty swat from his less enormous (but still quite large) hand. Kristen’s hair fluttered around her as she ducked what would have been a crippling blow and stationed herself behind a large rock at the edge of the pit. Ron did nothing in response to this and Kristen, sensing his confusion ventured out from behind the rock. One hand out in a calming ‘stay’ position, she eased toward him and rested it on his knee. Perhaps this was not the most appropriate place to touch a sasquatch on first meeting, but it was all she could reach. And patting someone’s feet is just weird. Aside from a low growl, Ron gave no indication of what he made of this. 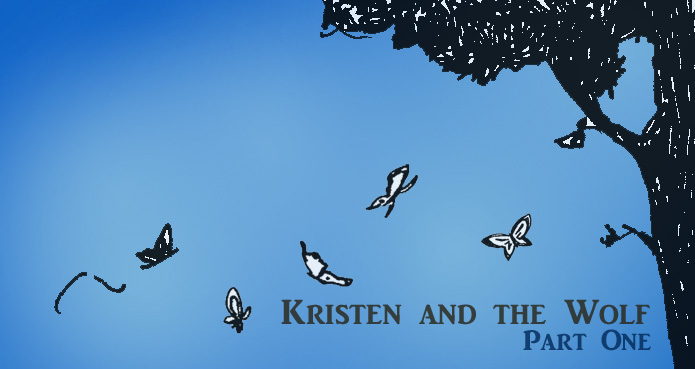 Before she could explore it further, Kristen heard voices above. They were too far away to distinguish words, but they did not sound friendly. Ron heard them too, and shuffled his feet restlessly, filling his lungs to protest but Kristen shushed him and patted his knee reassuringly. Taking hold of some roots protruding from the earth, she again undertook to climb. Before Kristen should answer, the face had moved away. She could hear him hollering to a companion with words that only made sense sporadically: “girl,” “ditch,” and “gun.” Kristen froze to the spot, her brow furrowed in thought. “I’ve already made sure of that!” Kristen screamed up at them. “Just calm down sugar, we’ll have you out in a jiffy.” The white beard was saying as his companion disappeared again. Kristen was perfectly calm. What were these jokers talking about? She looked at Ron and they shrugged. A strange metallic sound met their ears, which Kristen didn’t understand. It seemed to anger Ron, though, and he immediately became restive. Kristen knew why when the man with glasses reappeared, leveling a rifle down at Ron. Ron roared his name, stomping his feet in protest. The noise was deafening, but Kristen clung to her hand holds and screamed, “Nooo!” But the man with glasses raised his gun and took aim. Without thinking, Kristen simply flung herself off the wall and between Ron and the gun. Ron reached up to catch her, but the trigger had already been pulled, the bullet tearing through Kristen’s shoulder and lodging in the opposite wall of the ditch. Kristen lay in Ron’s hands, too much in shock to feel pain, but triumphant never the less. The next hour was a blur as the hunters worked to raise her out of the pit and tend to her wounds. She realized vaguely that night was falling and a fire was being made. Beans were coaxed down her throat and Ron was silent as she mentally willed him to keep quiet while the hunters were preoccupied with nursing her. The next morning Kristen’s shoulder was bound and throbbing, her arm in a sling. It’s winter. Even at the beach. And that has made it tough to get out and get some exercise. Writing is delightful, but it doesn’t afford much movement. That’s why I’ve been inspired by N.G. Davis in his effort to become a better screenwriter and a better runner. All his pictures have snow on the ground, so I’m betting it’s even colder where he is than where I am. So I resolved this morning that no matter the wind conditions (it does get might windy on the ocean), I would bundle up to my eyebrows if need be and get out there. I actually lucked out, weather-wise. It’s probably the warmest it will be all week, touching 48 degrees at 9am when I made it out, with wind at 7 mph. Almost balmy, you might say. As I marched across the sand and toward the edge of the Atlantic Ocean, I tried to remember the last time I’d been out for a run. I couldn’t. I do walk quite a bit, being in a tourist town where most modern conveniences vital to life are within a few blocks of my front door – the coffee shop, the library, the grocery store, the post office. But there’s no feeling quite like that of jogging down the beach as the ocean nips at your feet and invites you to go shoeless (not in 48 degree weather, thanks). It makes me look forward to warmer temps, but also solidifies my resolve to make it work regardless of the cold. Because it’s a step of intention. It’s a point I’m making about my life and the way I want to be. And I can always come back inside if it’s too cold. 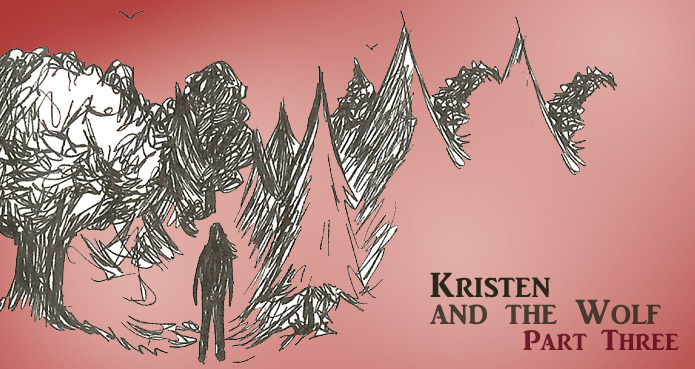 When we last left Kristen, she was on her knees at the edge of a ditch, reaching out to a faceless creature making roaring sounds in the thickening fog. From the sound of it, the creature was far below. Kristen reached down into the cavity as deeply as she could, but only grasped at rocks and mud for her trouble. A tree across the pit caught her eye – its viney branches like arms hanging down invitingly. She ran to it and tugged at the wooden vines, but none would give way. Going on adrenaline, Kristen began climbing the tree. She had never climbed a tree before, and she wasn’t altogether sure of her next move. But somehow she got a leg up and made it to the next niche. The bark was rough and unyielding against her tiny hands, but Kristen continued to climb. As she did, the fog abated and allowed her to see down to the ground – a feat which Kristen did not even attempt until she had fairly reached the top. But before that she was preoccupied with wrenching one of those vines free from its starting place somewhere in the trunk of the tree. She was unsuccessful. But happening to live nearby, a woodpecker perched by Kristen’s knee. She was so relieved she might have cried. Instead she dragged the vine close to the woodpecker’s beak and let it peck away. The woodpecker, true to its character, gave up long before the job was done. It had its fill of hard work and flew away, no regard for the hapless creature depending on its help. “Typical,” Kristen muttered under her breath as she twisted the vine where it had been pecked. Amazingly, the fibers of the wood began to separate. Kristen worked at it, her hope growing, as bit by bit the vine began to break free. A vehement roar from below prompted her to look down and offer reassurance. But the words died on her lips. Not only did Kristen suddenly realize how very high up she had gotten, but she could now clearly identify the impressions she had blindly followed through the woods. Footprints. Gigantic footprints belonging to a gigantic creature with gigantic feet, having been baited to fall prey to a gigantic ditch. This was it. Kristen had gotten herself into a full fledged adventure. We’ve all been there. Talking to a friend or hanging out in a group, and suddenly something happens. The back-and-forth ceases to go forth. It’s just you talking and the person you’re talking to is now somewhere else – metaphorically speaking. What happened? Any number of things – a ding, a ring, a super-loud Katy Perry ringtone. Or simply the silent arrival of an email. It’s become increasingly common for our lives, conversations, and thoughts to be interrupted by the electronic gadgets crying out for our attention. The cumulative effect of these interruptions is making it difficult to see anything through to completion – a thought, a conversation, a project. But I say it’s not too late. I say we take back our attention span. Be free! When you’re talking to your friend and the phone rings, ignore it. When you’re writing a screenplay and two emails pop up on your Outlook, save them for later! I believe it’s these little choices that will dictate the strength of our focus. Let’s stand up to our gadgets and show them who’s boss. Agreed? Just a minute, I need to get up before my legs fall asleep. It’s tough being 11 years old sometimes. You have to do a lot of things you don’t want to do, and you can’t do a lot of things you do want to do. You depend on grownups to take care of you and they don’t always do that very well. It’s enough to make you run away. Which is what Kristen did. Perhaps run is not the best way to describe it – drifted is more what she did. The school bus was grumbling down the street and Kristen thought once more about how much she did NOT want to get on it. The woods across the street seemed to beckon, and she simply went. The bus stopped and picked up the other kids while Kristen disappeared into the woods. She drifted around all day, not bothering to mark her trail and really not at all concerned about going back. She inspected wildflowers and dribbled her fingers in puddles. She talked to a garter snake, which led her to a beaver dam. The beavers were all gone, but a few fish played Marco Polo nearby. Kristen got into the water with the fish and touched their shimmering scales. The sunlight warmed the water, but it was still early spring and much too cold for a little girl to be getting herself soaked. The fish seemed to realize this as they nibbled at her fingers and nudged her knees. Eventually the fish came to the conclusion that the best way to get rid of her would be to leave her alone (thus the expression). Kristen was sorry to see the fish go, and wondered what she had done to frighten them. But she was beginning to get awfully chilly and hungry. An imposing evergreen stood on the other side of the creek, with boughs forming a natural teepee from high up the tree trunk to the mossy ground. Nestled inside the green tent, Kristen ate the peanut butter sandwich that Mrs. Bibbs had packed for her lunch. In here, it was not warm, but it was less cold. And it was dark. When she woke, it was difficult to tell anything had happened. She was still curled up next to the base of the tree and it was still vaguely bright outside the closely woven pine needles. But something had happened, Kristen could tell. Parting the branches, Kristen peered around the still forest. The air was still. The creek was still. Kristen ventured out and nearly fell. She had tripped on something. She looked down, but couldn’t see any impediments. Another two steps and the same thing happened. Kristen knelt down and felt the ground with her hands. It was a large indentation – about twice the width of her body, and longer than she could reach with one hand in either direction. Kristen crawled along, feeling with her hands, and soon there was another indentation. Slightly to the right this time, but similarly shaped. She went on like this for some time, feeling for the impressions in the dirt and crawling beside them. She was so engrossed she barely noticed a light rain was beginning to fall, and with it a deep mist clouded the forest. Kristen just kept following the shapes, crawling and scrambling over roots and rocks and flotsam. Thankfully she caught herself in time. With her vision impaired and her focus so absorbed, Kristen almost didn’t notice the gaping hole in the ground. But instinctively she put a hand out anyway, reaching out. Because someone else had not caught themselves in time. Someone was in that ditch. “Hello?” Kristen called. She had been nothing but calm all the day long, and not a thing had ruffled her – not missing school, not seeing a snake, not getting wet and cold in the creek, not even getting lost in the woods with no clue as to how to find her next meal. But now, knowing someone was in danger, Kristen was suddenly on the verge of panic. She was rewarded with a thick roar. It was a groggy roar, not frightening in the least. Well, yes incredibly frightening but this is Kristen’s language we’re speaking here. And to her ears, it was a sleepy, disoriented, docile yawn of a roar. The roar sounded again, more alert this time. There is no word-for-word translation, but Kristen understood enough to know there was no way this creature, whatever it is, could get itself out of the ditch alone. To write when one wishes to do anything but. It happens. We love to write, we want to write, we dream of writing, and then it’s time to write and we run away. I’ve been running all day: cleaning my oven (my OVEN, for goodness’ sake), baking, checking my email, and staring at the ceiling. So how do we settle down to write when everything in us cries out for oven cleaning? I’m sorry, that sentence is just so strange. Who wants to clean the oven? No one. Not even professional oven cleaners who started their business with just a cleaning kit and a dream, now with dozens of franchise cleaning services the world over. It’s a really unpleasant job. I would rather clean a 90-year-old toilet than an oven. But today, this is what I’m doing rather than writing. No more. It’s time to grab my writer’s block with both hands and show it who’s boss. Coffee, tea or hot chocolate, something warm and soothing does something to my nerves and helps me focus. Tonight it was tea (herbal, of course). Nothing smelly, just a warm light on a dreary howly night. I love music, as many people do. I find it immensely conducive to focus and relaxation – both of which are important parts of writing. You have to be in the zone, and once I get there, I may not even notice the music anymore. But some well-matched tunes definitely help to usher me through the gate. You can even take it a step further and follow Ryan Koo’s advice to create a playlist for whatever you’re working on, That way when it’s time to get back to your screenplay (or book, or poetry anthology), you can instantly replicate the vibe you had going last time. For the record, I took this advice, and it’s pretty good. What’s the worst that can happen? You write something horrible and have to go back and change it all. That’s the best part! Editing something you’ve already said in order to make it better is WAY easier than generating something in the first place! So relax. Write badly! With that in mind, I now bring you the official first part in our Kristen & The Wolf saga (the other part was really more of a prologue). If you’d care to suggest any additions to my list of writing helps, go for it. Kristen started at the new school three weeks after her 11th birthday. She had never been to a proper school before – she and Grandmom had lived far enough into the country that it was impractical for a bus to pick her up. Officially, she was homeschooled, but in reality Grandmom just brought her along to monthly errands in town. Kristen learned to count by watching the bank teller deal out Grandmom’s money. Kristen learned to read by staring at the letters on each item in the grocery basket as Grandmom put it into the cart. “Toothpicks,” Grandmom would say, and Kristen would nod solemnly, like she got it. Eventually, she did get it. Sometimes you gotta fake it til you make it. So the new school was a real experience, with lots to get used to, and the culture shock on top of losing Grandmom was a big deal for Kristen. She knew it was a big deal, and Mrs. Bibbs, her foster mother, talked like she knew it was a big deal although in practice she seemed surprised Kristen didn’t just line up and work it out. The Midcounty Elementary fifth grade class wasn’t the worst place to be new to absolutely everything. It wasn’t the worst at all, but it was uncomfortable for Kristen, who had to adjust to sitting indoors all day and nary a critter in sight. So when Miss Dinsmore announced they were having a field trip, it was like a ray of honey dripped into Kristen’s soul. It tasted like hope. The cherry on top was when a freckly boy to her left whispered across the aisle the location of this trip – not a field, as one might expect, but the mother of all outings. The only place Kristen had ever wanted to go apart from Mount Rushmore, or the moon. They were going to the zoo. That night Kristen stared at the white prickly ceiling of her bare bedroom and smiled from the bottom of her heart. She was going on a trip. And there would be animals. It was a perfect day. The sun was shining, the breeze blowing, and a little girl had offered to let Kristen sit next to her on the bus. As they each hopped off the bus and followed Miss Dinsmore through an enormous gate and to the promised land beyond, Kristen could barely breathe. She felt as if she were coming home. The sheer variety of animals all around her was breath-taking. Kristen didn’t even know what to call most of them, and none of them had ever crossed her path in real life. The Discovery Channel can only do so much to prepare you for such a sight. It was almost immediate, and completely unintentional, but when Miss Dinsmore did a head count at lunchtime, it made no difference to her agony of mind. Kristen, however, didn’t know she was lost and wandered quite cheerfully from the gorillas to the porcupines to the giraffes. She was disappointed that they were kept so far away. She wanted to go up to each one and get to know them. Standing at the gate between her and the lion, she felt frustrated. It was such a beautiful creature, majestic, lying in the sun flipping flies away with its tail. Kristen longed to go to it and rest its head on her lap. If only she could get through these bars. She stretched an arm through, up to her shoulder, but could budge no further. The cavern of space between them was only about a foot shorter than it had been a moment ago. And yet – was the lion coming toward her? It had nonchalantly – almost carelessly – risen to its feet. It shook its mane now and took a few steps forward. Now the distance between them was shortened by two feet. Feeling a spark of hope, Kristen stretched her arm out again, flexing her hand to beckon the beast to her. The beast obeyed. Step by step, almost cautiously, the lion came nearer. Kristen smiled as her hand finally met the lion’s nose. It nuzzled there for a split moment when a gasp behind her made Kristen turn and look. Someone wrenched Kristen away, and next the lion let out a bloodcurdling roar. Everyone was screaming. A zoo staff member was assuring them that everything would be fine. The lion caretaker was inside the habitat, trying to lead the lion away with a long pole. Kristen observed all of this with confusion. She had just enjoyed a beautiful moment with a ferocious animal. What was the big deal? Thankfully, her meandering next brought Kristen to the sea lions. There Miss Dinsmore finally located her disappearing student when Kristen appeared on stage next to the man flipping fish into the sea lions’ mouths and asked if she could try it.